Habitat: Desert, Upland, Mountain. 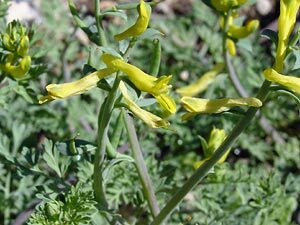 It grows in sandy areas like desert and canyon washes. Description: The oddly-shaped flowers have an inflated spur extending behind them and are 3/4 inch (1.9 cm) long. The flowers are followed by long, slender, curved seed capsules. The leaves are blue-green in color and finely dissected like those of a California Poppy (Eschscholzia californica ssp. mexicana). 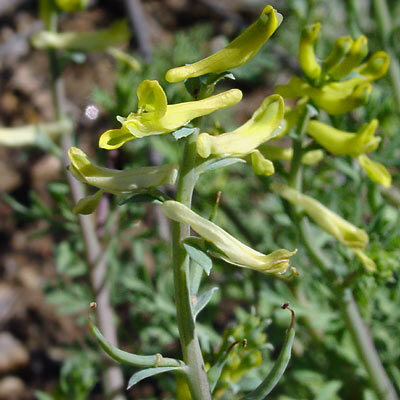 Curvepod Fumewort (Corydalis curvisiliqua) is similar in appearance, but it has more strongly curved flowers. 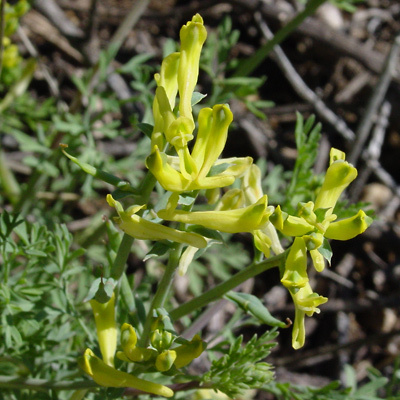 Poisonous – The plants are poisonous and contain the toxic isoquinoline alkaloid corydaline.